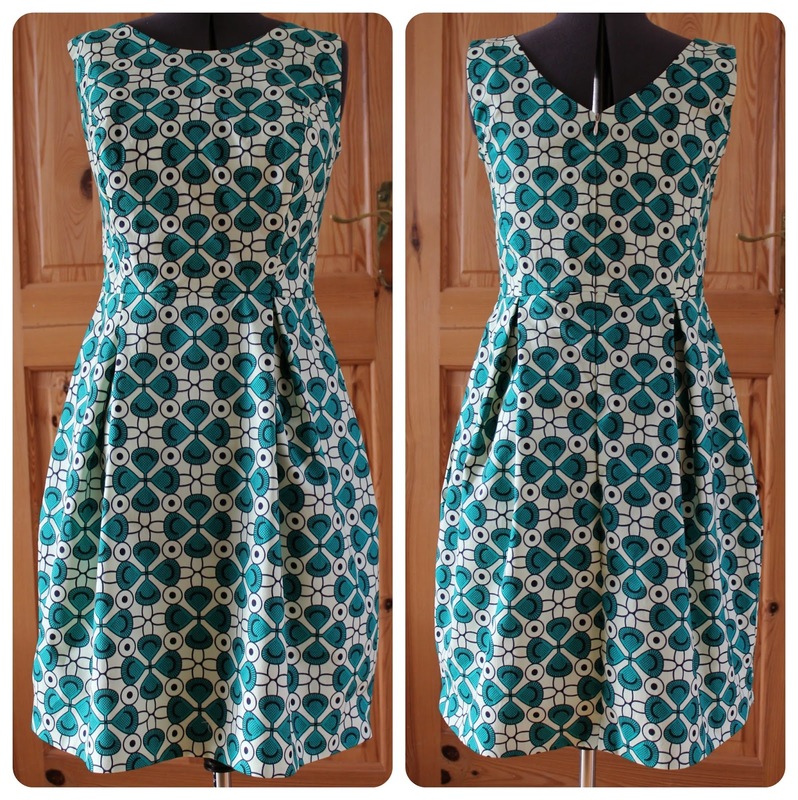 I finished a third Sew Dolly Clackett dress. Like the second one, I hadn't planned for this to be an entry, but last night it was all finished except for the hem, and when I tried it on, I though it had Dolly Clackett stamped all over it. I couldn't wait to get home from work today to hem it, get some photos taken and get them onto the Flickr group, because the competition closes tonight. The pattern is Elisalex from By Hand London. This is my third version (the other two are here and here). It was a bit breezy when I was taking my photos! I'm calling this the Lucky Elisalex because I think the print looks like four-leaf clovers, and also it came together without a hitch. The fabric is some African Wax cotton that I bought on here on ebay for £4.99 about two weeks' ago. I thought the stiffer wax cotton would be good for the shape of the skirt, and it turned out I was right! I underlined the bodice with some cotton lawn and the skirt with some polycotton, and used bias tape as the facing. I also added pockets using the pocket pattern pieces from good old Simplicity 2444. I fully expected them to make the skirt sit strangely, and that I would have to cut them out, but they are great! I've really enjoyed taking part in this sewing challenge, and I've loved seeing all the entries on the Flickr group; there is so much inspiration and new blogs to follow! Good luck to everybody who has entered; and more importantly, good luck to Roisin and Nic for their up-coming wedding! Wow, I love the fabric of this dress! Nice job! Love it. You've done Dolly proud! Thank you! I was really pleased with how the skirt turned out! Love your 'Marilyn' moment photos! Gorgeous fabric! LOL!! I hadn't thought of it as that! I was too busy wishing the wind would ever die down so I could get my photos taken! Wow, I bow before your amazing pattern matching skills! Lovely dress. Thank you! The front waist seam took three goes! That's so cute, I love it (and I might have just ordered some of that fabric....), but now I realise I'll need to at least try pattern matching. Yours is perfect! Thank you! Sorry about the enabling! ;) I am really pleased with the zip, the matching worked on the first go, but I made a horlicks of the back waist seam. Wowzers. I love the print. Good choice for an Elisalex it seems! Excellent pattern matching ninja skills as well. Thank you! This fabric is a great choice for an Elisalex, I love how the skirt sits. What a great dress! The color and shape are gorgeous on you! Perfect match of fabric to pattern! And yet another fab entry for sew dolly clackett. I've really enjoyed your others too, but would be hard pressed to choose a favorite! They're all beautiful. Thank you, you're too kind! I tell you what, having looked at all the dresses in the flickr group, I would NOT want to be judging this! Thank you! I love pockets, they just make so much sense, and I'm so pleased with how they turned out! I really thought they'd make the skirt hang like a sack of potatoes, but they didn't! Thank you! I second SDC being an annual event, what a great idea! Lynne, this is just gorgeous. Everything about this dress is fab and the colour is just perfect, it suits you so much. That's an amazing dress and it goes so well with your hair, Lynne :) I love that you showed the underlining as well, as I am particularly interested in it (I am still learning). I like that you used bias tape for the neckline finish, but I guess that only works when you have a round/oval neckline and no corners? Thank you! I always like seeing the innards of other people's makes, so try and show the innards of mine too. Re the bias tape facing: I haven't made anything with a square neck, so I can't say from my own experience. That said, I'm sure there has to be a way to use bias tape facing on a square neck, maybe a separate strip for each edge? Now I'm curious! I'll have to google it! Whaaaaaaaat?! This is out of sight, Lynne. The pattern matching is incredible and I love the way the skirt sits with the weight of the fabric. You look seriously adorable in this! Thank you! I'm really pleased with how the skirt turned out. The heavier cotton really did the trick! Lol! Thank you! There was a lot of crawling around on the floor, and cutting on a single layer. I'm still not happy with the back waist seam, but as Roisin says, you can't see the back when you're wearing it! I've just seen that this dress is a winner! How fabulous, I'm so chuffed for you! Many Congratulations Lynne, it was well deserved. Thank you so much! I can't quite get over it!! Congratulations! I must say that print is beyond fabulous! I now must check out African Cotton Fabrics. Love!